The power amplifier used is an integrated class-B output amplifier. It contains 4×12W single-ended (SE) or 2×24W bridge-tied load (BTL) amplifiers. The output speaker is connected in BTL configuration in this system for better quality. The above circuit components are same as given in circuit diagram of power amplifier circuit and ratings also same. Low-noise JFET-input operational amplifiers TL072 (IC1), car radio power amplifier TDA8561Q (IC2) and transistors BC547 (T1 and T2). IC2 has two 24W BTL output channels, one of which is connected to loudspeaker LS1. BTL is an output configuration for audio amplifiers, a form of impedance bridging where two channels of a stereo amplifier are fed the same audio signal. Audio from both the channels is mixed after level control. After mixing, the signals are fed to the buffer stage implemented with op-amp A1 of IC1 and the output phase can be reversed using switch S1A and S1B. This control can be useful to allow the subwoofer to be in phase with the loudspeakers of the existing car radio. 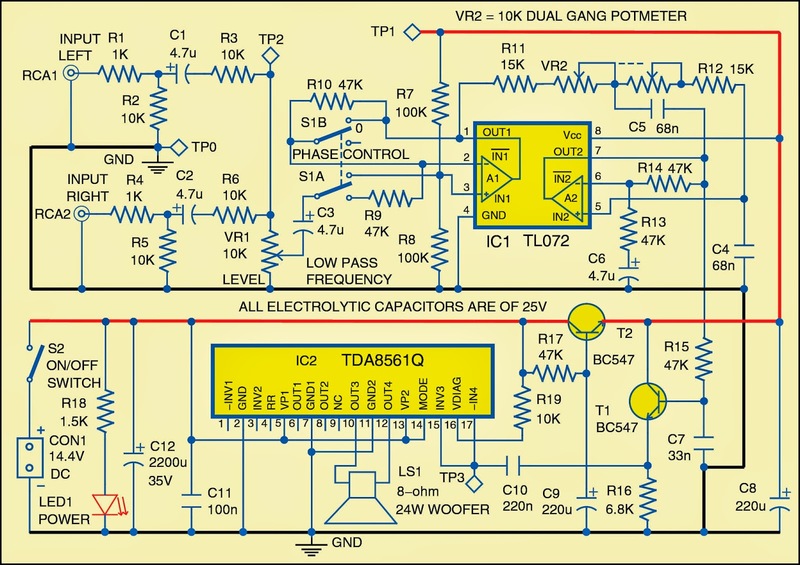 0 Response to "Low Noise Power Amplifier Circuit for subwoofer"